Internet access is offered in the student residences in Perth by an Internet provider and students will be given details of this on arrival in Perth. There is free Wi-Fi access on campus at Murdoch University and in a variety of local cafés. In Perth, you will live in a comfortable, furnished, double room in an apartment with other students, at Murdoch University Village, just a few minutes’ walk from the classroom buildings on campus. Every apartment contains a full kitchen, living room area, table and chairs, fan and two bathrooms. Murdoch University Village has a range of facilities, including a swimming pool, student lounge, TV room, e-library and study spaces, high-speed Internet, volleyball court and barbecue zone. Murdoch University provides 24-hour support for residents, with a dedicated team of Resident Assistants (RAs) and an evening duty manager. Apartments and common areas are only accessible by electronic swipe card and all individual bedrooms are lockable. The program fee is based on the standard accommodation. The Village offers a variety of apartment configurations (4, 5 and 6 bedroom apartments). Contact the AIFS Admissions Officer for further details and to pay a supplement to reserve another type of room including single rooms. You will be provided with a meal allowance to subsidize your grocery budget. 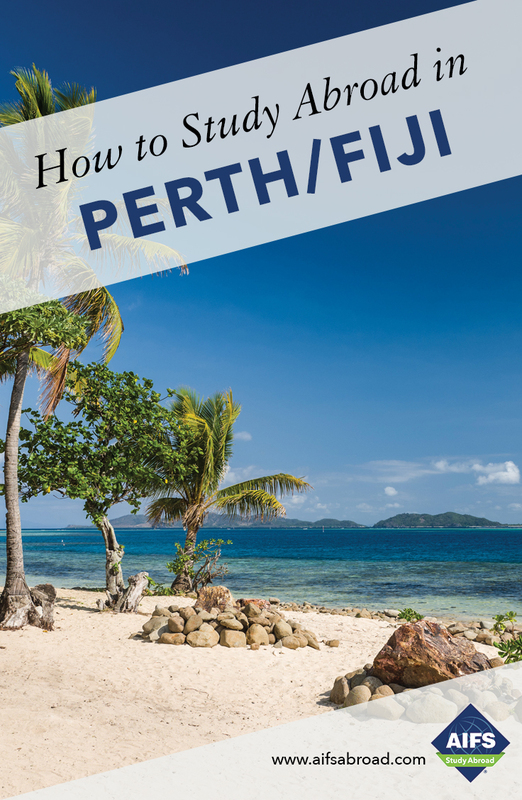 The meal allowance is worth approximately $1,000 and is a great help in managing your costs when you are in Perth. You will need to budget extra funds for meals, especially if you wish to eat in cafés and restaurants rather than preparing your own meals in your housing. Students may opt out of the meal allowance and pay a reduced program fee of $14,995. Note: Full Year students are responsible for their own housing and meals during the semester break. AIFS students will be given a TransPerth card (smart rider) on arrival which they can top up during the semester. Australians love sport and the facilities at Murdoch University are extensive. The Sports Center boasts a wide range of services and programs for students and visitors alike. Facilities include a multi-use sports hall (basketball, soccer, netball, hockey), basketball courts, badminton, volleyball and squash courts, outdoor multi courts for tennis and netball, an outdoor multi-use grassed oval, a group fitness room and a spin cycling studio. The Murdoch Guild Fitness Center is a modern facility with an extensive range of resistance machines and heavy duty floor space for multipurpose free weight training. Cardio machines include cross trainers, treadmills, rowers, bikes and steppers. Fitness classes such as spin, combat, fitball and freestyle are offered as are yoga and pilates. A Buddy Program is also available where international students are paired with a local Australian student. A volunteer experience can teach you about yourself, current issues, government services and the local community and it can also raise self-esteem. Volunteering and community engagement opportunities are arranged specifically for visiting international students and form part of the social and cultural program offered at Murdoch University each semester. The Student Union also has a ‘Volunteer Hub’ to help match student interests with volunteer opportunities. In the past AIFS students have volunteered at wildlife parks, music festivals, sustainability festivals, the Perth Royal Show, Perth International Student Festival and more. You can find out more about volunteer opportunities during the orientation period. The Australian government requires foreign students to pay for mandatory health coverage (Overseas Student Health Charge). Included in the AIFS program fee, this is paid directly to the provider, OSHC Worldcare, by Murdoch University. Hello! My name is Alice and I am the Assistant Study Abroad Coordinator at Murdoch University. I am a law and international relations student at Murdoch, in my final year of studies. I have a strong passion for human rights law, particularly as it relates to refugees. I spent 2018 in Korea, undertaking a semester of studies at Konkuk university in Seoul. I also completed a 6-month internship at the Global Green Growth Institute, an international organisation that focuses on environmentally sustainable development. In my spare time back in Perth, I enjoy bush-walking, applying 50 SPF sunscreen and going to the beach. I'm so excited to share my home state of Western Australia with you and I can't wait to show you all the incredible things to do Down Under.